President Obama’s recent nomination of Judge Sonia Sotomayor to the U.S. Supreme Court comes with the usual media sideshow of political opponents constructing all kinds of arguments against the appointment. If you remember Bork and Thomas, you know that these things can get pretty ugly. There’s ugly, and then there’s spreading fear and racial tension through the blatant misrepresentation of words (in this case, mistranslation of words). One such mistranslation entered the public sphere yesterday courtesy of former Republican Congressman Tom Tancredo on a nationally broadcast news program. Tancredo stated that Judge Sotomayor’s membership in the civil rights group National Council of La Raza (NCLR) makes her unfit to serve as a Supreme Court Justice. According to Tancredo, and now a cacophany of misinformed parrots, La Raza is an anti-american racist organization — a “Latino KKK” whose slogan is, “All for the race. Nothing for the rest.” La Raza has had to deal with extremist groups mistranslating their name before, and to be fair, it is a false cognate situation, which can be tricky for translators who don’t take into account the contextual nuances of language and culture. The term La Raza has its origins in early 20th century Latin American literature and translates into English most closely as the people or, according to some scholars, as the Hispanic people of the New World. The term was coined by Mexican scholar José Vasconcelos to reflect the fact that the people of Latin America are a mixture of many of the world’s races, cultures, and religions. 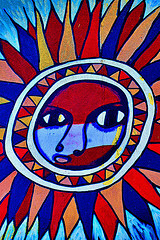 The photo above depicts a portion of the Murals at Centro Cultural de la Raza, Balboa Park, San Diego, California. Courtesy of Michael in Flagstaff.